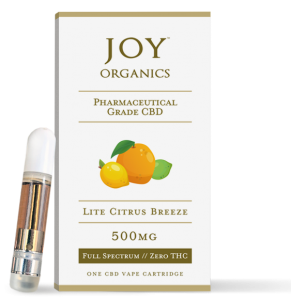 CBD Oil Review rates Joy Organics with five stars because it qualifies for the Quality, Safety, Charity, Mission & Innovation Badges. The mission of Joy Organics is to set a standard of purity and bioavailability in the CBD business. The founder had significant trouble finding CBD products that actually worked, which inspired her to create a company people can rely on. Everything is grown and processed in the U.S. and verified by stringent testing to create extremely effective, full spectrum supplements. Joy is known to donate sales proceeds to legitimate non-profits, and her business is steadily growing as more and more consumers discover her potent, affordable products. 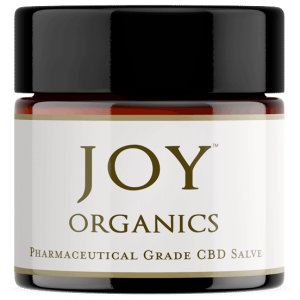 Buy one Joy Organics Premium CBD Product and get the second for 50%. Use the promo code BOGO at check out. The inspiration behind Joy Organics is the experience of Joy herself, the founder and owner of this family-run business. Joy suffered from both chronic pain and sleep problems, and her search for a natural remedy led her to CBD. She tried seven different CBD brands, only one of which was effective, which prompted her to create an honest company with pure products that can aid health issues and transform lives. Joy’s personal journey echoes through each facet of the company, ensuring quality at every stage. They source industrial hemp from Colorado, grown according to the latest organic methods. Their growing/manufacturing partner employs scientists, formulators, and other hemp experts that regularly consult with the Joy Organics team. They utilize a proprietary hemp extraction method using food-grade ethanol and exclusively sell full spectrum products for the combined synergistic effect of CBD with other cannabinoids, flavonoids, and terpenes. We recognize the innovative aspect of Joy Organics in their water-soluble nano-emulsion technology used to process their softgels and salve. Hemp compounds are converted into nano-sized emulsions, making each drop of oil up to 200 times smaller than usual. They are quickly and more easily absorbed into the bloodstream for faster relief due to their significantly smaller size. With this technology, users need less product to experience the desired effects. Every product sold on Joy Organics is tested multiple times in house. Monthly tests are conducted by third party laboratories for potency, contaminants, and residual solvents. Joy Organics uses only a proprietary strain of PCR (phytocannabinoid-rich) hemp for their formulations, so they get high marks for consistency. The product line includes CBD oil tinctures that contain MCT and/or grapeseed oil and/or hemp seed oil as the carrier. The CBD softgels that utilize nano-emulsion technology are available in original and combinations with melatonin and curcumin to promote sleep health and anti-inflammation, respectively. The CBD salve is also produced via nano-emulsion for topical application, and there is a vape pen currently in the works. Pets are part of the Joy Organics family too, with dog treats and CBD tinctures geared specifically toward them. Bottom line – The ethos and dedication behind Joy Organics are obvious. 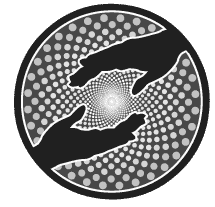 We observe their motivation to help others not only in their business practices and product quality, but in the charitable endeavors of Joy herself. We confidently award Joy Organics the coveted esteem of all five badges. Joy Organics uses industrial hemp grown organically in Colorado and employs a clean extraction method. Joy Organics conducts multiple in-house tests on every batch of product and monthly third-party tests for potency, contaminants, and residual solvents. 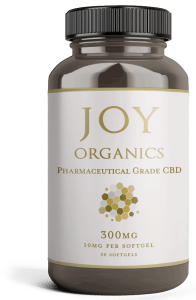 Joy Organics has a clear mission to improve people’s lives by providing full spectrum, affordable hemp supplements that are proven effective. Joy Organics donates sales proceeds to multiple charities, and their Fort Collins Store sells items that directly support struggling communities around the globe. Joy Organics employs water-soluble, nano-emulsion technology to render compound particles smaller, increasing their absorbent effect. I love Joy Organics! I chose them (even though they are a newcomer to the CBD industry)because they use organically grown hemp in Colorado with GMP. I love how fast the CBD softgels work since they go through the additional processing to make them water soluble. I love that the softgels are 300 times more bioavailable than oil tinctures which makes my monthly CBD budget less (more bang for the buck!). I love her very potent salve. With chronic back pain from a herniated disc, Joy's company has made my life more bearable. Recently there was "Joy Day" on her birthday and all the products were 40% off. With so many sales that day, she will be able to provide 202,000 meals to child refugees in Uganda. Agree 100% with this review because I'm a tried and tested customer.